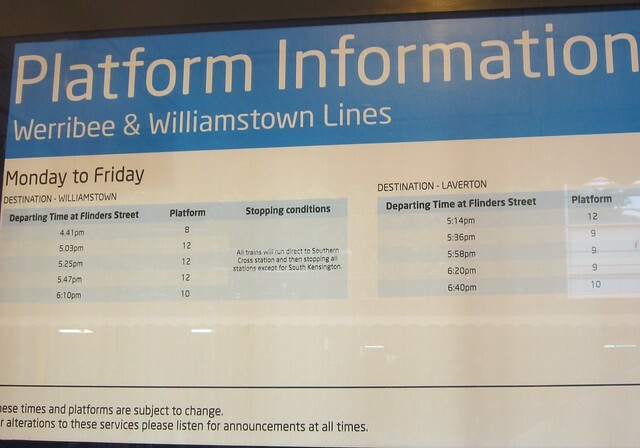 Quite apart from their abysmal and impossible to remember timetable with trains every 22 minutes, Williamstown and Altona Loop/Laverton passengers aren’t too happy about evening peak confusion at Flinders Street. It’s not hard to see why — departures are from four different platforms, and passengers say these are often changed at the last minute. This problem also affects all passengers for Seddon, Yarraville and Spotswood, or those wanting the first train to Newport. Also notice the sign mentions Werribee in the heading, but none of the trains listed go to Werribee. It might be helpful if it mentioned that all Werribee trains depart from platform 10.